A needlepoint Christmas stocking can become a treasured family heirloom. Nothing says Christmas like a beautiful stocking, and what better way to decorate your handmade Christmas stockings than with a beautiful needlepoint motif? Most readily available kits and instructions show a needlepoint Santa or a wintry scene, and this handmade gift is sure to be treasured for generations to come. Perhaps the easiest way to get started on your needlepoint Christmas stocking is to purchase a kit at your local craft shop or online. A kit is nice for a big project like this because it includes everything you need to complete the project, from the stocking fabric to the thread to detailed instructions and charts. This is convenient because you can get started quickly. It's a big project, so you'll want as much time to work on it as possible. Needlepoint Fun has five pages of stocking kits, all of which come with painted canvas. That makes your work even easier because you can follow the color changes on the canvas itself as well as on the chart (the charts are also in color). Many motifs are available, from snowmen to nature scenes. You can find another good selection of kits at Needlepoint Heaven. This site offers a wide range of designs, from a golfer nutcracker to toys, Noah's ark to gingerbread people. On this site you can purchase the kit with or without yarn, so if you have a big stash, you might be able to save a little bit of money. Check out Salt and Pepper for a selection of stunning needlepoint Christmas stockings, from winter scenes to all sorts of Santas. The kits are labeled to tell you which are complete kits, which are counted cross stitch versus stamped, and which are made with appliqué rather than stitching. 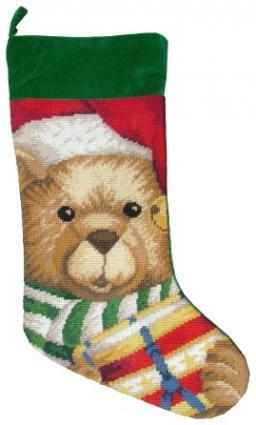 123 Stitch has a large selection of Christmas stocking projects. Decide how big you would like your stocking to be. Now choose the fabric size. Most needlepoint kits use 13 count or larger. Cut out the stocking shape from your cross stitch fabric and whatever fabric you want to use for the back of your stocking. Choose a design motif based on the space you have to use. Tape together a bunch of pieces of graph paper and sketch out a design, or incorporate designs from fee sites like Free Patterns Online or Craft and Fabric Links. Use colored pencils to graph the different colors in the design. If you're computer savvy, check out this tutorial on using Paint Shop Pro to build a stocking design. Designing your own needlepoint Christmas stocking will take more time and effort, but it will produce a truly unique and beautiful gift for whomever you choose to give it to and will be treasured forever. August: Choose your pattern and buy the fabric and other materials. September: Begin working on your project. You can work on it for an hour, estimate how much you got done, and then use this estimate to figure how much time every day you will need to spend on your project. October: Continue working on the project. Try to be done with the needlepoint by the end of the month. November: Finish the needlepoint no later than the middle of November. Begin sewing the stocking together and adding any other embellishment. Wrap and label the gift, if desired. December: Enjoy the season without the stress of finishing up projects at the last minute. Work on your stocking for about an hour a day, and soon you will have a beautiful Christmas stocking to give as a gift or leave for Santa to fill. Needlepoint stockings are very special, and this piece may become an heirloom in your family.